The first and most immediately important task of updating the Sage Android application as part of Google’s Summer of Code is to update the way the app interacts with the Sage Cell Server, which performs the calculations in the cloud so that the Android device doesn’t have to locally. Currently, the application communicates with the server through a series of HTTP requests — the client (our app) initializes the connection, then sends and receives query data back and forth from the server. This all sounds fine and efficient, but by relying solely on HTTP requests, the client ends up having to constantly poll the server to check the status of the calculation (to see if there are any updates), which is inefficient and not ideal for a light application on a light device. 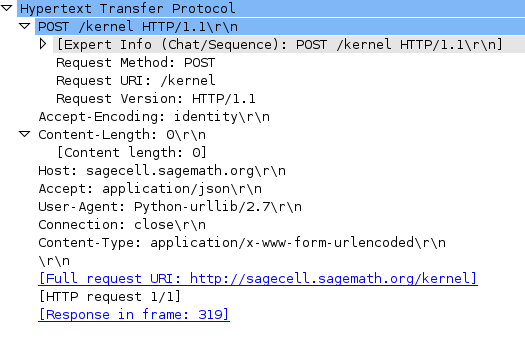 It’s a decent way of doing things, but the year is 2013, and the Sage Cell Server now supports WebSocket, so my first task is to update the app’s client-server interactions so that users can once again send calculations and receive results. First, the client must make initial contact with the server in a sort of “handshake” between the two. The app will send an HTTP request, and the server will reply with connection details, at which point the WebSocket connection may be established. This seems easy to implement, but as someone who hasn’t spent much time with networking in Java, I had some difficulty getting hands to shake. The requests I was sending were seemingly correct, but the response I received was similar to that of visiting the site directly from a web browser — 405: Method Not Allowed. How could I let the server know that the app was special, and that it wanted to have meaningful interactions together? With some help from Volker, I was able to see that the issue was in the headers of my request. First, it seemed as if I should use GET instead of POST, which turned out not to be the case. The POST I was looking for (via the Python client), as revealed by WireShark. I was advised to make use of WireShark to inspect each request I was making (using the Python sample client as my example of proper HTTP ettiquette). A POST request was being made, but it was being made to the wrong URI — I ended up using Java’s built-in URI functionality to generate one properly. At this point, all that was holding my request back from serverside acceptance was its headers. By adding Accept-Econding:identity, I finally had intialized a proper POST request, as indicated by the server’s response. At this point, the server responds with a simple JSON object that contains a “kernel_id” and the “ws_url”, indicating that it is ready to begin our session with the information provided. Using the WebSocket URL and the kernel ID, it is simple at this point to establish a connection through one of the many fine WebSocket libraries that exist for Android. Two connections are made: an IOPub socket and a Shell socket. Once the connection is established, the rest is simply a matter of sending and receiving calculations and results in JSON form on both channels. The IOPub channel details the status of the calculation, while the Shell channel deals with the calculation and results themselves. Data is only sent and received when something has actually happened (at which point either the client or server can react accordingly), and once everything is done, the connection is closed. Especially when considering more advanced features such as Interacts, the improvement in networking and overall efficiency and simplicity from switching over to these sockets is clear. Handling results and sending/receiving calculation data in general should be simpler now that the client/sever networking process is simplified. Now, it is a matter of getting everything to work together in order for us to run calculations from the app itself. Although at this moment it has no functional networking capabilities (and therefore cannot perform calculations), you can download the older version of the Sage Math Android app from the Play Store and view (and even contribute to!) the source on GitHub. 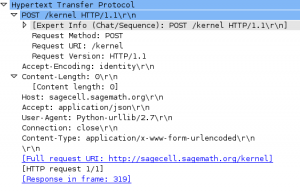 You can also read more about the Sage Cell Server and its interactions on the GitHub Wiki. Next Next post: Sage for Android Testing APK Now Available!